Prince Lobel Recognized in 2018 Edition of Best Lawyers "Best Law Firms"
In the eighth edition of U.S. News – Best Lawyers® “Best Law Firms,” Prince Lobel has received national rankings for its accomplishment in Media Law, Commercial Litigation, Litigation: First Amendment, and Litigation: Banking and Finance. It has also received Metropolitan rankings in twelve practice areas, including Commercial Litigation, Criminal Defense: General Practice, Criminal Defense: White Collar, Insurance Law, Litigation: Banking and Finance, Litigation: First Amendment, Personal Injury Litigation: Defendants, First Amendment Law, Litigation: Intellectual Property, Media Law, Product Liability Litigation: Defendants, and Family Law. 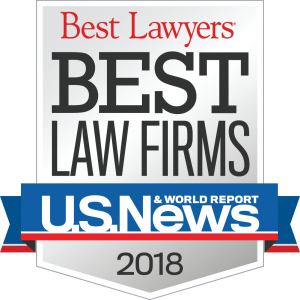 To be eligible for a ranking, a firm must have a lawyer listed in The Best Lawyers in America®, which recognizes the top 4 percent of practicing attorneys in the US. Prince Lobel has 14 attorneys on this year’s “Best Lawyers” list. The firm as a whole has been recognized as a “Best Law Firm” since 2010. The rankings for law firms are derived from a combination of client feedback, the regard that other lawyers have for our firm, and our responses to the law firm survey sent to us by U.S. News researchers. Ranked firms, presented in tiers, are listed on a national and/or metropolitan scale. Receiving a tier designation reflects the high level of respect a firm has earned among other leading lawyers and clients in the same communities and the same practice areas for their abilities, their professionalism, and their integrity.